For years, I’ve experimented with many different kinds of cheesecake recipes, but I always end up going back to this one, since it’s one that my mom has been using since she started baking. There’s sour cream both inside the cheesecake, and on top with the topping, and now regular old cream cheese cheesecakes just don’t do it for me. So without further ado, here is my all-time favourite cheesecake recipe. Then combine your graham cracker crumbs with butter in your pan. Once combined, spread in an even layer to create the base. Like I mentioned in my Coconut and Chocolate Chip Squares recipe, I use a spatula to firm up this base and to prevent cracking. Next, beat your cream cheese with the sugar for the filling. Add the eggs one at a time. Make sure you beat well after each one. Stir in your vanilla and sour cream and watch how yummy the cheesecake becomes now. Pour this filling over the crust and bake for 45 to 50 minutes, or until a toothpick inserted comes out clean(ish). When the cheesecake is done, combine your sour cream with the sugar and vanilla and then spread it over the hot cheesecake. 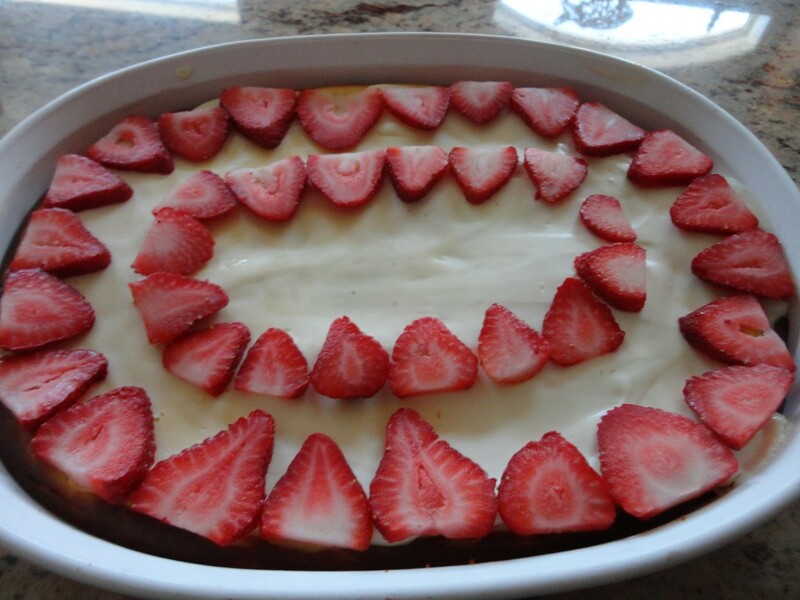 Bake it for 5 minutes more, and then when cooled, top it with lots of strawberries. And that’s it! Despite how many steps I have up here, it’s really a very simple cheesecake. The sour cream just adds a really yummy taste in the cake, and then the sweet and tangy topping just adds an extra touch. This entry was posted in Cakes and Breads, Recipes and tagged cheesecake, recipes, sweet. I’m drooling right now! I LOVE cheesecake!! Although I didn’t discover my love of cheesecake until about 3 years ago. As a kid I always refused to try it because I imagined that the cake would actually taste like cheese. Now I’m hitting myself for all of those wasted years I spent cheese cakeless! This recipe sounds fabulous! Nope! Just bake it all at once at the end.